Every interaction with Amazon S3 is either authenticated or anonymous. 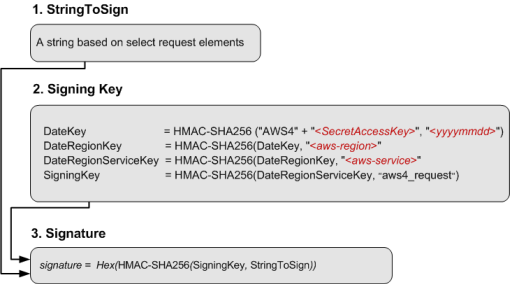 This section explains request authentication with the AWS Signature Version 4 algorithm. If you use the AWS SDKs (see Sample Code and Libraries) to send your requests, you don't need to read this section because the SDK clients authenticate your requests by using access keys that you provide. Unless you have a good reason not to, you should always use the AWS SDKs. In regions that support both signature versions, you can request AWS SDKs to use specific signature version. For more information, see Specifying Signature Version in Request Authentication in the Amazon Simple Storage Service Developer Guide. You need to read this section only if you are implementing the AWS Signature Version 4 algorithm in your custom client. Verification of the identity of the requester – Authenticated requests require a signature that you create by using your access keys (access key ID, secret access key). For information about getting access keys, see Understanding and Getting Your Security Credentials in the AWS General Reference. If you are using temporary security credentials, the signature calculations also require a security token. For more information, see Requesting Temporary Security Credentials in the IAM User Guide. In-transit data protection – In order to prevent tampering with a request while it is in transit, you use some of the request elements to calculate the request signature. Upon receiving the request, Amazon S3 calculates the signature by using the same request elements. If any request component received by Amazon S3 does not match the component that was used to calculate the signature, Amazon S3 will reject the request. Protect against reuse of the signed portions of the request – The signed portions (using AWS Signatures) of requests are valid within 15 minutes of the timestamp in the request. An unauthorized party who has access to a signed request can modify the unsigned portions of the request without affecting the request's validity in the 15 minute window. Because of this, we recommend that you maximize protection by signing request headers and body, making HTTPS requests to Amazon S3, and by using the s3:x-amz-content-sha256 condition key (see Amazon S3 Signature Version 4 Authentication Specific Policy Keys) in AWS policies to require users to sign S3 request bodies. Amazon S3 supports Signature Version 4, a protocol for authenticating inbound API requests to AWS services, in all AWS regions. At this time, AWS regions created before January 30, 2014 will continue to support the previous protocol, Signature Version 2. Any new regions after January 30, 2014 will support only Signature Version 4 and therefore all requests to those regions must be made with Signature Version 4. For more information about AWS Signature Version 2, see Signing and Authenticating REST Requests in the Amazon Simple Storage Service Developer Guide. HTTP Authorization header – Using the HTTP Authorization header is the most common method of authenticating an Amazon S3 request. All of the Amazon S3 REST operations (except for browser-based uploads using POST requests) require this header. For more information about the Authorization header value, and how to calculate signature and related options, see Authenticating Requests: Using the Authorization Header (AWS Signature Version 4). Query string parameters – You can use a query string to express a request entirely in a URL. In this case, you use query parameters to provide request information, including the authentication information. Because the request signature is part of the URL, this type of URL is often referred to as a presigned URL. You can use presigned URLs to embed clickable links, which can be valid for up to seven days, in HTML. For more information, see Authenticating Requests: Using Query Parameters (AWS Signature Version 4). Amazon S3 also supports browser-based uploads that use an HTTP POST requests. With an HTTP POST request, you can upload content to Amazon S3 directly from the browser. For information about authenticating POST requests, see Browser-Based Uploads Using POST in the Amazon Simple Storage Service Developer Guide. Authentication information that you send in a request must include a signature. To calculate a signature, you first concatenate select request elements to form a string, referred to as the string to sign. You then use a signing key to calculate the hash-based message authentication code (HMAC) of the string to sign. In AWS Signature Version 4, you don't use your secret access key to sign the request. Instead, you first use your secret access key to create a signing key. The signing key is scoped to a specific region and service, and it never expires. The following diagram illustrates the general process of computing a signature. The string to sign depends on the request type. For example, when you use the HTTP Authorization header or the query parameters for authentication, you use a varying combination of request elements to create the string to sign. For an HTTP POST request, the POST policy in the request is the string you sign. For more information about computing string to sign, follow links provided at the end of this section. For signing key, the diagram shows series of calculations, where result of each step you feed into the next step.The final step is the signing key. Upon receiving an authenticated request, Amazon S3 servers re-create the signature by using the authentication information that is contained in the request. If the signatures match, Amazon S3 processes your request; otherwise, the request is rejected.